I’m happy to welcome Susan Merrill today to my blog! I’ll be chatting with Susan (and Rod Olson) later today on Living Inspired! Click here for full details about Susan and Rod and their books, as well as a giveaway of their books! And tune in today at 3 CDT to listen to my interview with them! 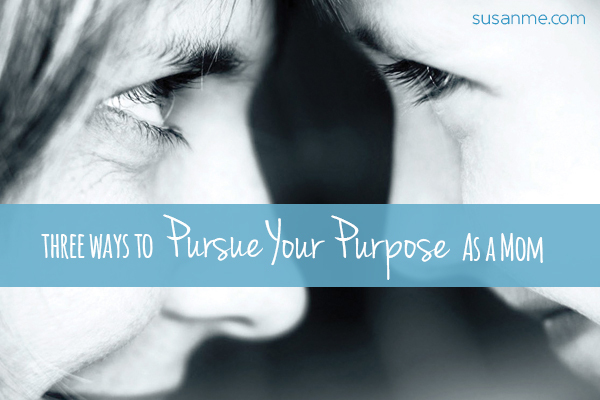 How can you pursue your purpose and passion as a mom? Susan Merrill shares her tips. Sometimes it can be challenging to dream big when it comes to raising our children. There are so many little ways we can fail them—by setting a bad example, by going back on our word, by being selfish with our time. These small failures build up until we come to the point where we just want to survive parenting and hope our kids turn out alright in the end. But this is no way to live. That’s why setting grand goals for your kids and working to achieve them through parenting is so important. Pursue Your Passion: We toss around the word “love” all too frequently. We say we love our job, love our house, or love our favorite restaurant. And while I think it’s fair to say that these things can all be desired, I don’t think we can ever truly love stuff. What you truly love are your passions—your family, your spouse, your children. Once you recognize that these other desires fade with time, you will be able to focus your gaze on the true passion of motherhood. Pursue Your Purpose: As a mom, your hope and vision should not be to just “get through” parenting. No, your purpose is to be with them every moment, every step of the way, and to encourage them as needed. Your purpose is to run into the front yard when they fall, kiss their scraped knee, and give them a Band-Aid. Your job is to stay up all night with your heart-broken daughter and cry alongside her, before reminding her of how wonderful her husband will one day be. Your job is to encourage your son to do well in school so that one day he can be a doctor, be a fireman, or even run for president! Pursue a Plan: Now, if your dreams for your kids seem incredibly impossible, you’re on the right track! Because once you’ve allowed your passion to form a fiery purpose, it’s time to carry it out with a solid plan. Here are some practical questions to ask yourself in creating a unique plan to fulfill your purpose as a mom. —What are your core beliefs? —What is your goal for your children? —As a mother, how will you work to reach this goal? I believe every mother has passion for her child. Some moms have been distracted from their passion; some are sick or weary and their passion is drained low, but it is in there somewhere. But do we all have a vision of where that passion can carry us, a goal for our child that is so big and intimidating that it is impossible without God? I think we need more moms to ponder, to pray, to catch a vision for their children, to add in more passion and turn the vision into a purpose. More about Susan: Susan Merrill, author of The Passionate Mom, is a wife, mother of five, director of iMOM.com, want-to-be blogger, and the “very imperfect” Merrill family manager. Susan lives in Tampa, Fla., with her husband, author and President of Family First, Mark Merrill, and two or, depending on the day, up to five of her children ages 16 to 22. On those days she happily forsakes all other responsibilities to run a bed and breakfast /laundromat for her college-aged children.